NASA continues to throw public money at their missions to explore the solar system and beyond. This is all well and good except for the fact that they continue to keep the public in the dark about their discoveries. Recently they declined to comment about their close encounter with Phillis Light Serpent somewhere near Uranus and now it would appear that they are covering up clear photographic evidence of alien civilisation by simply ignoring the fact that it is there. 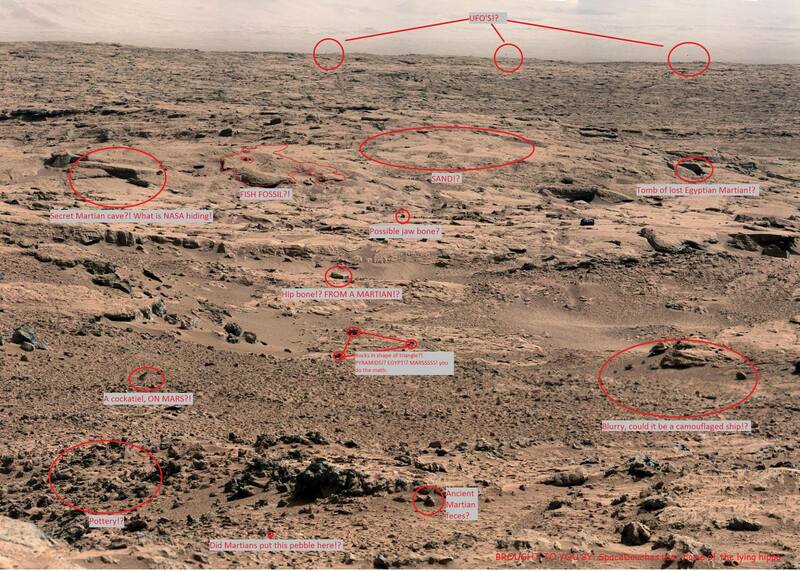 A recent high resolution photograph taken by the curiosity rover clearly shows a panorama of alien artefacts ranging from what is clearly a Martian tomb to some discarded Martian pottery. This outstanding photograph has been presented to Joe public as: "Just another cool picture from Mars." Our resident scientologists here at Natural Newd have acquired an enhanced version of the photograph from reliable sources on the Internet. The enhanced version clearly shows the above mentioned artefacts as well as a host of other enticing tidbits. We ask our valued readers to comment and to do their own research on the subject. We believe that with a little investigation and an outcry from the public we can finally get what our taxes pay for: ALIENS!